Here it comes. This is a furious pace. Yes, it's finally, really happened. 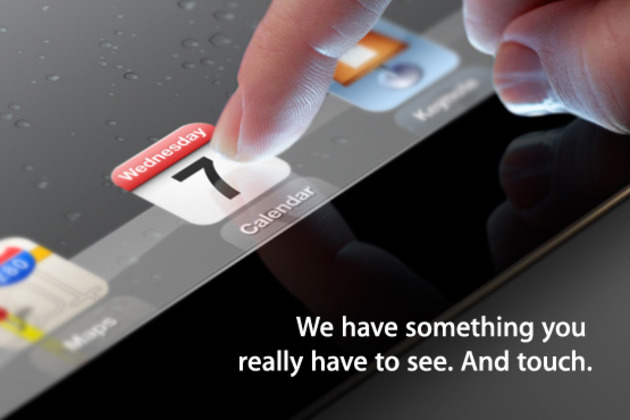 We just received our invite for Apple's next big event — almost certainly where the announcement of the iPad 3 (or iPad HD, or some other name no one has guessed yet) will take place. The event is being held at the Yerba Buena Center for the Arts in San Francisco at 10AM PST, on Wednesday, March 7th, and the Verge team will be there covering the news live as it happens. Until then, let your imagination run wild about the next iteration of the world's most popular tablet!